The 2015 Rock ‘n’ Roll Liverpool Marathon & 1/2 Marathon generated a total economic impact of more than ₤4.22 million for the city, according to an economic impact study conducted by the San Diego State University Sports MBA program. The 2015 event attracted more than 12,000 runners from around the world including USA, Ireland, Denmark, Germany and Spain. Currently, registration is up 100% since last year with 5,000 participants already signed up for the 2016 race, which will take place on 28th – 29th May. The report also showed that the event filled 16,028 hotel room nights, producing ₤1.58 million in new tax revenue and other tourism-related fees collected by local government. Participants involved family and friends over race weekend with an estimated total of 10,000 spectators in 2015. The 2015 event took place on 13th – 14th June with a new Rock ‘n’ Roll 5K on Saturday. Many runners participated in both days of running to complete the “Remix Challenge,” meaning they were awarded finisher’s medals for each distance completed and a special Remix Challenge medal to commemorate completing two races. On Sunday, runners had the option of participating in the marathon, half marathon and 1-mile. The 2016 race returns with a marathon, half-marathon, and 5-kilometer distance over the weekend of 28-29 May 2016. The 5K will return again on Saturday 28th May and both the marathon and half-marathon will be held on Sunday 29th May. The marathon and half marathon will once again start and finish by the Albert Dock, one of the most visited attractions in the UK and a World Heritage Site. The races will feature scenic views of Liverpool’s stunning docks, rich architecture, spectacular museums and historic commercial districts. In true Rock ‘n’ Roll fashion, live bands and cheering spectators will line the route, concluding with a celebratory finish line festival and concert in front of the Echo Arena. For more information or to register for the race, please visit RunRocknRoll.com/liverpool. The 3rd annual Rock ‘n’ Roll Liverpool Marathon & ½ Marathon will welcome more than 16,000 participants on 28th – 29th May 2016. 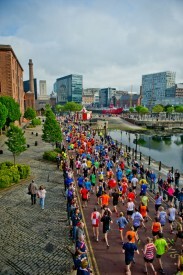 The race starts and finishes along Liverpool’s waterfront, featuring scenic views of the stunning docks, rich architecture, spectacular museums and historic commercial districts along the course. Live bands and entertainment are staged along the 13.1-mile and 26.2-mile courses. The event weekend concludes with a finish line celebration and post race concert. For more information about the Rock ‘n’ Roll Liverpool Marathon or to register for the event, visit RunRocknRoll.com/liverpool or follow @RnRLiverpool on Twitter.